After a quick trip to the shop to buy a helmet I pushed off on my first bike ride in 15 years. Very exciting as you can see! 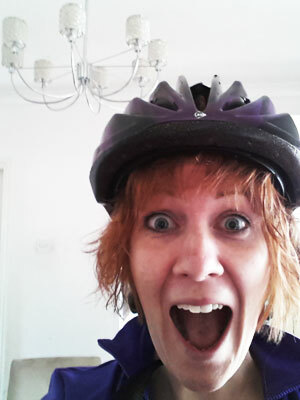 My lovely £8 black and purple bike helmet. Sure to keep my head in tact! I wasn’t alone, my slightly more experienced other half – Chris, and two mutual friends (Jack and Leanne) joined me. Or to be more accurate, I joined them. Jack and Leanne marry in July and for the stag-do in May, Chris will join Jack and many others on a bike ride from Nottingham to Paris. Ouch! The cycling gang! Left to right: Leanne, Jack and me, Gemma! Chris is behind the camera – by choice. I’d like to be clear that this isn’t something that I’m ever aiming towards. Nice local rides are fine by me. Back to my first ride – we rode 16 miles from Long Eaton, via The Carpenters Arms in Dale Abbey and back. What a fantastic way to spend an afternoon in the sunshine. I felt really safe and managed to keep up with the others with little effort. Even up the hills! However, I’m in the process of arranging a one to one with Ridewise who’ll come to my home and advise me on ways I can feel safe when out on the road. And wait for it… assessments with Ridewise are free for all staff and students at the University. I’m not on commission or anything but still, you should book your session today! Within an hour of completing the ride, I was good for nothing – absolutely knackered.